We know how eagerly one awaits the arrival of their orders, which is exactly why we’re working round the clock to make sure deliveries are attempted against all your special orders within 48 hours for Lahore, Karachi and Islamabad, and between 3-5 working days for all other cities nationwide. Fabric quality is the core essence of our identity, and our unwavering commitment to quality defines us. Every piece is carefully crafted from the finest yarns and fabric, making for quality pieces that will see you from this season through to the next. Consider our garments and fabric as an investment, with both our insurance and assurance. For more details on the fabric, check out our fabric glossary. Here at Sapphire, our only measure of success is how happy you are with us. Your feedback is what makes us push ourselves and our product to be the best, while ensuring that we continue to create premium material at an attractive price-point. If you face any issues with your order, wish to exchange an item, or are unsatisfied with your purchase for any reason whatsoever, we will make sure your concerns are addressed and resolved between 1-7 days on a priority basis. For us, you and your needs always come first! 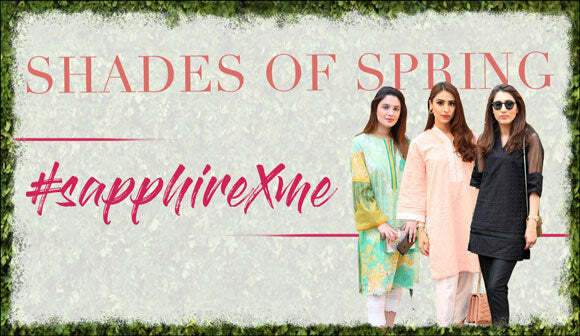 Sapphire gathered a group of inspiring bloggers and lifestyle influencers at Fuchsia for a meet and greet. Click to view highlights! exclusive items, and new arrivals as soon as they hit the site!